OK, so if you haven’t seen the video for OK Go’s latest single, “White Knuckles” then you have missed out on a few minutes of great entertainment. If you know the band, then you know they strive to make creative and amusing videos to go with their music. These are the guys who danced on treadmills for their song, “Here It Goes Again” which has been viewed over 1 million times. These are also the guys who immersed themselves into a Rube Goldberg maze for “This Too Shall Pass” and that video has had over 17 million hits. 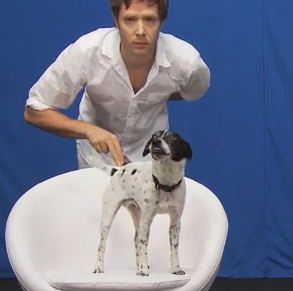 “White Knuckles” will appeal to all of us pet owners because the stars of the videos are dogs. The dogs run up ramps, jump on chairs, roll in on Ikea-looking furniture, and bounce around to the music. These are the most well-trained dogs you may see in a music video and the best part is these dogs were rescued dogs from shelters who found forever homes. “White Knuckles” premiered on the Ellen Degeneres Show last month and has already been viewed over 6 million times. The video took over 200 takes, the dogs were trained with clicker training methods and treats, and the band has set up a page where you can download and buy the video. A percentage of the sales will help the ASPCA (American Society for the Prevention of Cruelty to Animals). OK Go made the video in Portland, Oregon and Corvalis, Oregon over the course of two weeks and according to the band, the point wasn’t to have perfectly synchronized actions but to make a video that anyone could make with a lot of patience and time. The dogs aren’t all pure breeds and they aren’t show quality. They are just family pets who were lucky enough to be in a video advocating for their fellow canines and felines and hopefully had fun doing it. If you’re counting down the hours till your weekend starts today, take a few minutes and watch “White Knuckles” and then take your pup out for a romp around town!